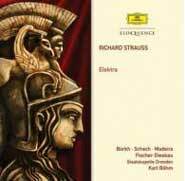 Karl Böhm made the first complete stereo recording of Elektra in 1960 for Deutsche Grammophon and to this day, remains one of the sonically and artistically most exciting recordings of this work. Böhm knew Strauss personally (the booklet includes a delightful photo of the two of them relaxing together!) and conducted several premieres of the composer’s works. All the principals, led by Inge Borkh, are thrilling and incisive, and it is fitting that in this, the 150th anniversary of Strauss’s birth, this key recording be reissued.